The Wand of Wishing is a game for the Playstation Portable (PSP) that was released in early 2006. It tells the story of a Petpet named Fluffy, and his quest to recover the ancient Wand of Wishing from the evil Werhond. 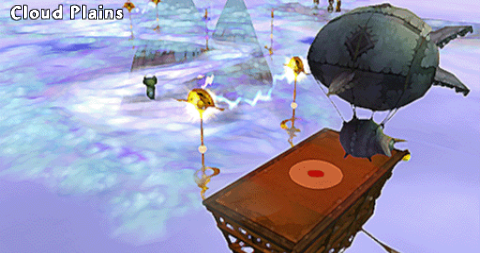 The game takes place in the alternate universe of Petaria, which is populated mainly by Petpets, which was later used in the background story of Petpet Park. In the Wand of Wishing, you gain Neopoints and items by opening treasure chests, destroying breakable objects, and killing enemies. However, it is important to note that these do not respawn, so in effect there is a limited amount of Neopoints in the game. As such, it is not possible to buy everything, train elemental alignments to the max, and increase stats to the max. You must pick and choose what you spend very carefully. In addition, the game locks you out of previously visited areas as you progress in the story. This means that, if you don't kill all the enemies/claim all of the treasure in a given area, it is possible to completely miss out on those rewards for the remainder of the game. As a general rule of thumb, explore all dungeons completely the first time you enter them, and do not run away from fights unless you absolutely must. To begin the game, select 'New Game' from the main menu. You'll be given the opportunity to select your character's name, and species. Each species comes with its own stat bonuses and elemental alignments - but don't worry about these. All stats can be changed in game via training or the use of certain items. The only thing you'll be setting in stone is the way your character looks - you can even change the colour during play! After selecting your character, the game will begin with a cutscene. Seems Megan's having some trouble - scary stuff, eh? When you finally get control of the character, you'll be in Petaria, in a location known as Haffaklax Farm. This area is essentially just training. You'll get on-screen instructions guiding you through the basic controls, picking up weapons, and destroying haystacks. Each area will have objects similar to he haystacks which can be destroyed when attacked. They can contain coins, or useful items, so make sure to break open any you see! Next up, it's finding and opening a treasure chest, you'll find it behind the windmill. Next, you'll come across the local farmer. He'll tell you that some pesky Scamanders have been going after his crops, and will give you the task of dispatching them. This is the first taste of active combat, but it isn't too difficult. If all else fails, just keep mashing X and hope for the best. Remember, some of the farmer's vegetables are breakable, and might contain coins. With the Scamanders beaten, Haffaklax will open the gate leading to the next area, and give you a quest to find his wayward son. Don't worry, you'll come across him soon enough. First thing's first, let's talk to the Symol hiding behind the first windmill you come across. It's the farmer's son, and in return for completing the quest, you'll get a magic scroll (Magic Rock Scroll). Don't worry if you can't use it yet, we'll get to that later in the game. In any case, it will be disappearing from your inventory a little later on. Take some time to explore the village. There are plenty of things to break open, and a few chests to discover as well. 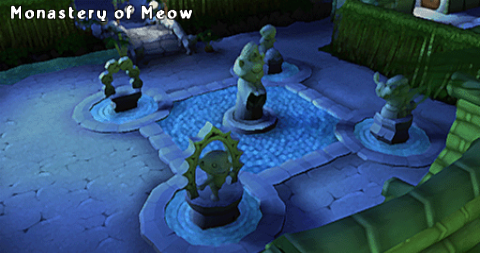 In the heart of the village, you'll find a statue of a Meowclops. These are the game's save points - and also act as teleporters back to town should you find a dungeon too much for you. 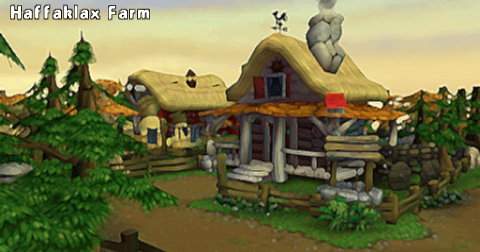 You'll also find a Petpetpet on the road to the village's southern exit. Petpetpets can be captured if you drop their species's favourite food nearby, and equipping them will give you stat boosts. When you're ready to progress, talk to the Sage Bush in the north west. He'll give you a new quest - or rather, tell you about three quests you need to complete. The first can be started just across the bridge from where you are - Maggie needs a Green Apple, which can be found at Grahm's food shop. Take it back to her to receive a Blueberry Roll. Next, there's Terrie waiting by the village's water wheel. She wants a wooden sword from Jared's weapon shop. Again, go buy one and return it to her to receive a Toy Sling and 150 Neopoints. The final quest is talking with Farmer Haffaklax's son - but we've already done that - go us! With those complete, return to the Sage Bush, who will take the three items and send you to speak with Castra the Crone. Calling her by her real name will cause new weapons to open up in her shop - magic wands. Now you're free to spend, spend, spend in the village. Magic wands and the stock of the weapons shop will all serve as upgrades to your basic staff. What you choose is up to you - but personally, I go with bows. They have a high rate of fire and can be used at both long and short range. You'll also find the Battledome next to the weapons shop. This useful side game can be used to earn tokens, which in turn can be used to raise your stats up to a maximum of 25. You have to pay a fee to battle monsters, but if you have a friend with a PSP, you can challenge them in the Battledome for free. 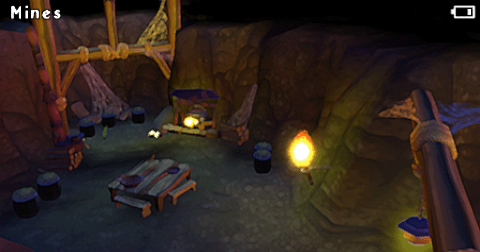 Nearby you'll find Gunble who will offer you another quest - finding his brother in the mines. What a coincidence, as that's where you'll be heading next! Leave the village to the south and it is off to the next area. Straight away you'll come across Simon. Talk to him for another quest - he wants you to recover his scarf from the bandits further up the road. You'll come across them very soon. For now, there are two types of bandit. The purple ones attack with short range weapons, so keep your distance and attack them. The green ones, however, are equipped with bows. To deal with them, get close to them, as their attacks become far weaker. You should find Simon's scarf in their camp, so return it to him to get an Agility Orb (use it to raise your current agility stat). Beware the red barrel in the bandit camp. These are explosive - if you hit them while next to them, they will explode and you will lose a lot of health. Either ignite them and retreat to a safe distance (using Square), or blast it from a distance. Continue on up the path to come across another enemy type - Crokabeks. It's best to keep your distance from these enemies, as it makes it easier to attack them. Don't worry about the locked gate half way down the path for now - focus on the path that's open. Pretty soon you'll be at the entrance to the mines. 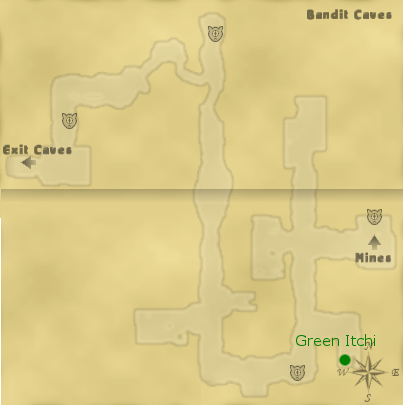 You'll be coming up against cave Slorgs in addition to bandits in this area, which can be difficult in numbers. Again, best to keep your distance to attack if you find yourself having problems. 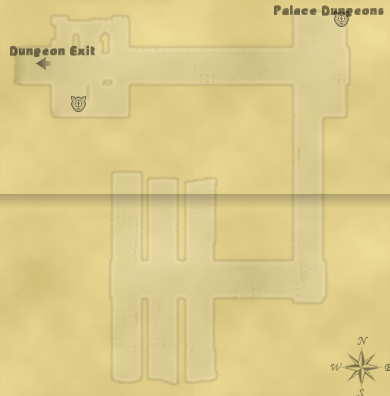 This area introduces another feature of dungeons - traps. You can see them from the spotted colouring of the floor. Step on them, and spikes will rise up out of the ground, damaging you. Avoid them if you can - but keep in mind that enemies can be damaged by them just the same. After the first junction, you'll come across a mine cart blocking your way to the left. Hold Square and a direction to move it forwards/back along the tracks. In the next room to the north, you'll come across a small puzzle. To begin, move the cart to the other side of the room as you did with the previous one. With that done, push the nearby lever to switch the tracks, and then push the cart again to open up the next area. Follow the train tracks until you cross a bridge. Here, you'll come across giant Slorgs - much more dangerous than the smaller versions. It's best to challenge them at close range, as they have very powerful ranged attacks. Take the right hand fork to continue on, though there is a treasure chest straight ahead if you want to explore. Along the right hand path, you'll be locked in a room with several small Slorgs and a club bandit. Dispatch them, and then use the switch to open the doors and continue on. Up ahead, one more switch to enter a new room. Take two rights and keep following the path until you reach a lift. This is your destination, leading you further into the caves. Those cunning bandits! They hid in the deep mines! You'll come across a crossroads fairly early on. Straight ahead should be your first goal - kill the bandits in here to gain a cell key which you'll be needing later on. The right hand passage leads to a training area, and the left hand passage is where you should be heading next. At the next fork, heading left will take you to a room with a Green Itchi inside. There's a nice little Easter Egg in this area - a map on the wall could possibly be a world map of Petaria. Down the other passage, you will come across Wenble, Gunble's brother, in the cells. The Cell Key will free him and get you a Petrified Mushroom, but you'll need to return to Terrasymol for your real reward. Continue on for a scene - you've found the Werhond, but he's not sticking around. Next, you'll be trapped in a room by the Werhond. The key to escaping is overloading the furnace, and to do that you need to block the vents using the mine carts. Careful, the steam from the vents can damage you if you walk through them. 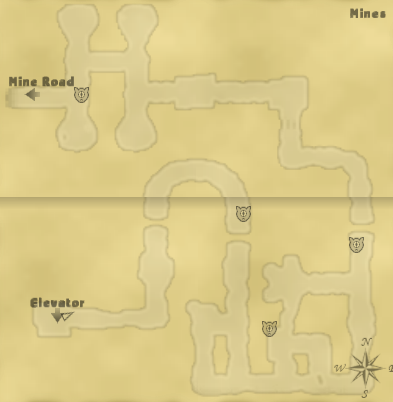 When all three vents are blocked, a new path will open that will lead you back to the mine road. Now you'll be on the other side of that locked gate from earlier, which will be magically unlocked. The path you're on will lead to the Forgotten Jungle, your next destination, but don't be so quick to rush there. 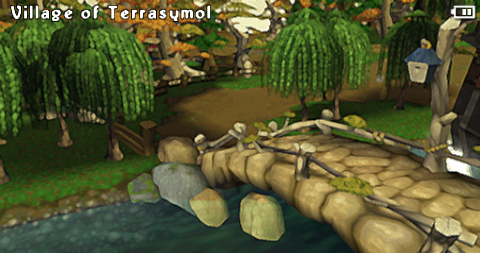 Return through the unlocked gate to Terrasymol, and collect your reward for rescuing the miner (Silver Mallet). When you're ready, proceed to the jungle. Cobralls are the first new enemy you'll find, along with more powerful Crokabeks. The Cobralls have both long and short range attacks, but the long range attack is weaker so attack from afar. 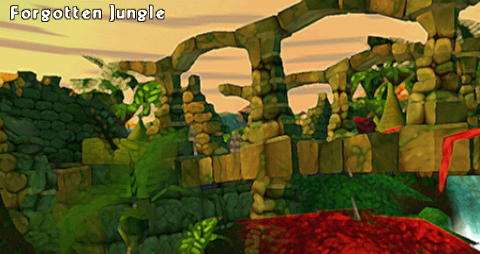 You'll also come across hidden traps (covered by leaves), and falling columns that will damage you if they hit you. The Forgotten Jungle houses the first of many rainbow pools you will find scattered throughout Petaria. This one will turn your Petpet blue - you can return to your Petpet's base colour later in the game, but this is the only chance you will get at the blue colour. Soon, you'll reach a temple-like area. Beware, the enemies here get harder, and there are spike traps and statues that fire arrows if you stand in front of them. Some of the Meowclops statues come to life here - there are two types. The first type have powerful short range attacks, but no long range attacks. You can guess how to deal with them. The second have powerful earth-based magic attacks that are long range. If you are hit by their blasts, you will either be damaged or held in place for a short while. Keep moving to stay safe. Soon, you'll come across another Petpetpet. WARNING: When you enter the Monastery, you will be locked out of all the previous lands. Finish up any business you have before leaving. The Monastery boasts a new Petpetet (north east corner), a new Battledome, a decent weapons shop, a food shop, and a new type of shop. It will sell items that can change your elemental alignment, allowing you to use many of the scrolls that you come across in your travels. Personally, I never find much use for the scrolls and sell almost all of them, but if you like them then you'll need to spend time changing your alignment. For now at least, the items should be out of your price range. When you are ready, approach Khao Manee, the Abbot. He's in the north west, next to the golden scratching post. This will trigger the attack of the bandits. Saving the monks is optional, but you might as well. 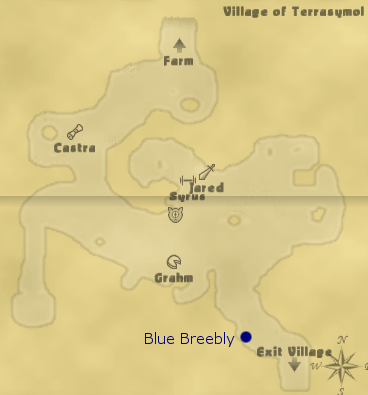 Bagrel will be stood nearby and will offer you a quest. Recover three incense sticks from fallen bandits for a reward (Battle Spoon). The purple bandits now have an upgrade - they can launch powerful bombs from a distance. Get close to them and they'll switch weapons, that's the best way to deal with them. When you're ready, head down the passage next to the Abbot to reach the Chamber of Seals. The room you start in has several exits, but only one is available to start with. Follow the passage, going straight when the path forks. One of the bandits here will drop a book. Pick it up and head back to the fork, taking the other route. There is a bookshelf here that you can put the book on. Doing so will open a secret passage containing a moveable statue. Drag it out of the secret room and further down the passage where you'll find a pressure pad. Put the statue on it to open the nearby door. In the next room, there's another pressure pad. Stand on it to open the door at the end of the other fork. Here you'll find yet another pressure pad that will open the second door in the main chamber. You'll come to a new chamber with two passages leading off it, one of which will be locked. Taking the open one will introduce you to a new enemy type - Splykes. They have a powerful long range attack, so stick close to attack them. At the end of the corridor there is a crate of explosives you can light to open up a new path. Down this new passage, you'll find a few small Splykes and one giant one to deal with. There will be a switch behind the large Splyke that will open up a secret room with a pressure pad. Standing on that will open up the locked door you saw earlier. A nearby switch will open up another wall and take you back towards the door that just unlocked. Down the next corridor you will find a new Petpetpet. There's a moveable statue for the pressure pad nearby. Using it will reveal a room with a treasure chest. Taking the passageway will lead to a room with another pressure pad. This one doesn't need a statue, just stand on it to open the nearby door containing a treasure chest. WARNING: By going down the next corridor, you will trigger a scene that will result in you being locked out of the Chamber of Seals area forever. Finish up any business you have before proceeding. Watch the scene and you'll be thrown straight into a boss battle. The Bandit Lieutenant can be dangerous if you aren't paying attention, so be careful. His main attack is a powerful short range swing, but he can also launch a powerful blast of dark magic your way that can freeze you. As if that wasn't enough, he also has an annoying area of effect spell that is quite damaging. You can tell he's going to do it when he paused in mid-slam - just run away to avoid it. Never playing fair, he'll demolish the building when you win - forcing you to run. Once you are outside you'll have control back again. The Monastery is once again safe and the Abbot will open a path to Miamecca for you. WARNING! Once you go down that path, you are completely locked out of the Monastery and all the lands beyond it. There is no way to ever return to them. If you have any business, do it now before leaving. You'll find a Battledome to the west upon entering the city - it'll be the only Battledome you have access to for the rest of the game so remember where it is. Miamecca's a big place, the main city is split up into three different areas. If you want to skip ahead to the story, just head north until you find Sergeant Zim, but there are a fair few side quests you'll miss. There's a big rainbow pool in the center of this area - four colours to choose from (grey, orange, green, and purple). These correspond to the base colours of each of the four species of player Petpet, so you can use them to wash off any colours you find during your adventures if you want. Next to that is Cafe Mia. The shopkeeper there will give you the quest of finding some foods (Organic Mushroom, Tomato, and Cheese) - you'll get them at the stores in Market Street, to the east. The reward is five Mega Sandwiches. There's an armour shop run by Ethne on the way. 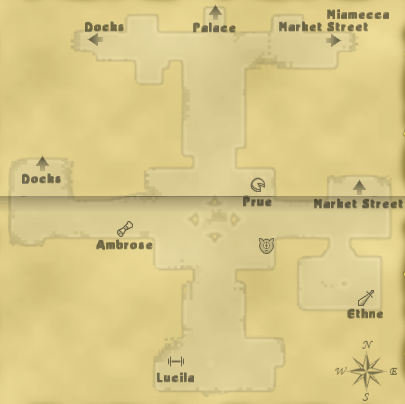 Market Street has many shops, and later in the game will have a few quests as well. 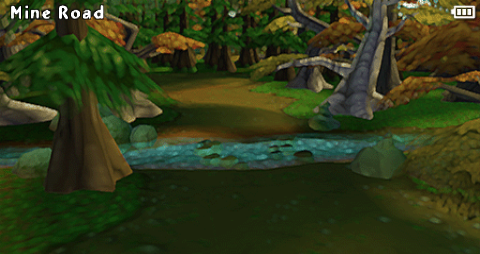 For now, buy Prue's foods and maybe stop off at the weapons shop for a new bow, before returning to the main street to complete the quest and heading off to the west. You'll find Ambrose the Apothecary on your way, but the main destination is the docks. Entering from the south, you'll come across Geb, who has lost his boat. Talk to the Harbourmaster to learn that it is hidden in the north west (behind a breakable). Return the treasure you find to Geb for a reward (1000 Neopoints). There is another elemental alignment shop here, along with a scroll shop, a weapons shop, and a Petpetpet in the north east if you are interested. 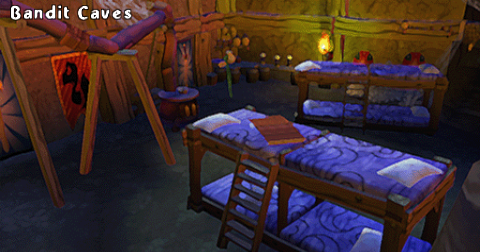 In order to unlock a quest later in the game, make sure to talk to Sonya while you are here. With that done, return to the main street and speak with Zim in front of the palace. Zim will give you the quest of recovering the Eye of Miamecca. This is fairly easy done. Just head to the location where you saw the thief disappear in the cutscene. He'll be there waiting, and he'll hand over the eye. Return it to Zim for access to the palace. For now, the palace grounds just have a lot of breakables and a Petpetpet. When you are ready, enter the throne room for a brief scene, as you get kicked out pretty soon. The rudeness! Nothing to do now but return to the main street of the city. There, you'll be arrested, and thrown into the palace dungeons. You'll soon be let out of prison by the thief, so take some time to explore. The switches nearby will unlock the remaining cells. Continue on down the passageway to find the armoury. Here you need to move a block in the corner to reveal a switch. Pulling that will open up the passage leading downwards. Now we're in the catacombs proper, and there are ghosts and ghoulies ahead - and treasure, of course! Several new enemy types here. The first ones you'll come across are Barbats, which act a lot like the Crokabeks from earlier in the game. They also have an attack that will infect you with darkness that will drain your health (similar to poison). Take either path to continue, but beware of falling rocks in this area as well. Next you'll come across ghosts who appear out of walls. They have strong long range attacks, so be careful. In one of the following side rooms you'll come across an explosive barrel. Light it to demolish the wall and reveal a secret room. 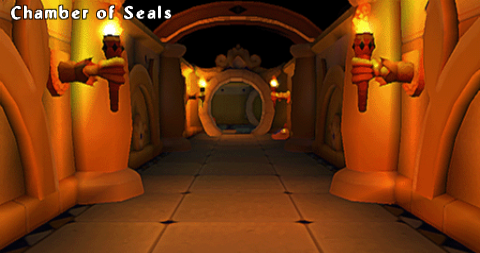 In the next section you'll come across a stronger variant of the Splykes from the Chamber of Seals. Your options here are left, right, or straight ahead. All will lead to the same place. The next area has four forks leading off. We'll need to go down all of them eventually, but the one immediately to the left should be the last you attempt. Heading down the one immediately to the right, you'll come across another enemy type - Imps. They have powerful magical attacks. At the end of this passage you'll find Ky. Accepting his quest will spawn some Fire Splykes from the nearby ovens. Defeat them to claim your reward - a Purple Pearl. Return to the main chamber and take the passage on the far right. At the end you'll find Henry. His quest is a simple yes or no answer - the answer is no, but it doesn't matter which option you choose. Either way he will reward you with a Blue Pearl. Return to the main chamber, this time taking the far left passage. At the end you'll find Tia. She will send you on a quest to recover some stolen notes. These are dropped by Barbats that will now spawn in the area. Once you have three, return to Tia for a Pink Pearl. Finally, return to the main chamber and take the only remaining passage. At the end, you'll find Rey. With the other three pearls in your pocket, he'll hand over the Green Pearl. With all four, return to the main chamber and place the pearls into the large tomb. Doing so will release the next boss, King Toogah. King Toogah has a variety of water-based attacks. He has a powerful swipe, an area of effect spell that produces a type of whirlpool around him, and some bolts of magic that he can fire from his trident. Just keep moving diagonally away while firing and you should be fine. With him defeated, the exit to the catacombs will open up. WARNING: Leaving the Catacombs will seal them off forever. Finish your business before leaving. We're back! Oh dear, things don't look right - bandits are attacking the palace! Nearby you'll find Elspeth, who will offer you a quest. Get her necklace back off the bandits for a reward (return it as soon as you get it - you won't have access to this area for much longer). For your efforts, you will get 500 Neopoints. The Meowclops bandits that have showed up are very dangerous. The ones with bows are very powerful, get close or keep moving to deal with them but be careful. The magic, staff wielding Meowclops bandits are less hard, but still dangerous. They have earth magic that can hold you in place. Inside the throne room, the bandit lieutenant is back :( This time, he's more aggressive, so more dodging is needed. If all else fails, the columns near the throne will work as cover to deflect his long range attack (but not the area of effect one). After you beat him, talk to the Empress on the throne. She'll give you a Small Pouch and 1000 Neopoints. Leave the throne room to return to the Palace. The bandits are gone and normal characters are back. 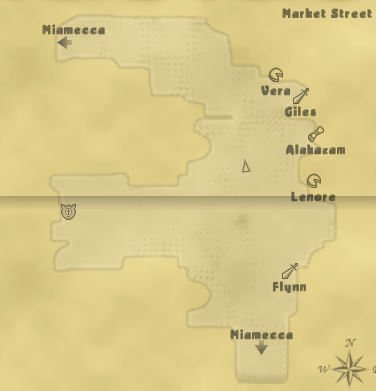 Near the large flower in the center of the map, the Mysterious Thief will pop up and direct you to the caravan in Market Street. 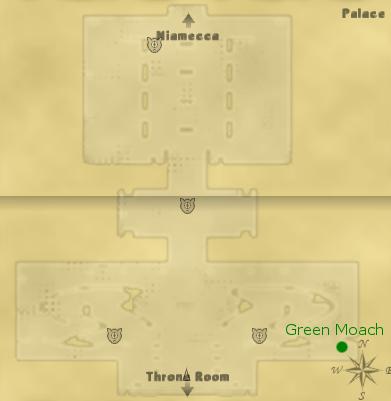 WARNING: After you leave the Palace, you will be permanently locked out of both the Palace and Throne Room for the rest of the game. Finish up any business you have before leaving. The western desert is your next destination. Head to market street - there you'll find that Joby is giving out a new quest. He needs you to gather elemental foods that you'll find in the areas you'll soon be visiting. He needs a Cloud Ice Cream, Flaming Hot Pizza, and Snow Sub, so make sure to save one of each as you find them. Omar is also new, the Petpet by the Apis. He'll give you passage to the desert if you talk to him. Omar will drop you on the outskirts of the desert, you have to go the rest of the way on foot. Here, scarabs and Scamanders are on the loose, but there are also dangerous sandstorms. They take your health if you run through them, and they cannot be harmed like enemies - so run away. Scamanders are upgraded versions of the ones you met back on the farm, while Scarabs have a fire based long range attack. As always, get close to attack them and reduce damage. Soon you'll come across Janif by the oasis. He'll ask you to find his Apis. 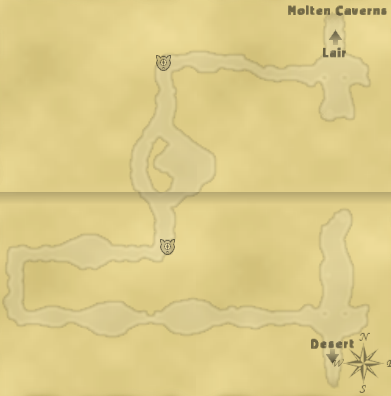 There are two in the sandstorm desert area, and a final one on the 'black road' near the volcano. In order to complete the quest, you need to feed all three. The reward for this is 1000 Neopoints. While on the black road, you'll also find a new Petpetpet. 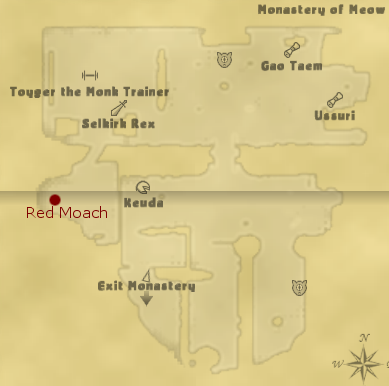 Kreshmaul is also in the sandstorm area, he'll ask you to find a golden chisel for him. Finally, you'll come across an urn in the desert. Pick it up and take it to the oasis to fill it. Then take it to the Giant Head Statue in the north east (It'll be swarming with baby Scamanders) to receive a Founder's Ruby. On your way out, you'll be attacked by a giant Scamander - presumably the mother of the ones you just killed. 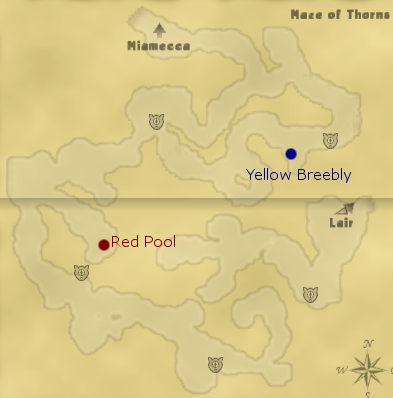 Beyond the wall, you'll find two shops and a few chests - there's also a magic shop in the far north west and a yellow colour pool. To the west, you'll find a place to put the ruby you just got - doing so will open up the Temple of the Founder. Around this area you'll also find Wadjet enemies. They have a long range poison blast so, like Scarabs, get up close to attack. The Founder will finally show up, and explain the history of the wand, but then the Werhond and the Advisor will show up and things will start going south. You'll be launched into a boss fight against the Advisor. He has a few attacks, a powerful swipe and a long range dark magic blast. Just keep circling him while firing a long range weapon to make short work of him. Unfortunately, you don't get to give the same treatment to the Werhond, as he grabs the wand. The Temple falls down as Fluffy and the Founder escape. Outside, the Founder will explain you need to find the six elemental guardians to have a hope of stopping the wand. As luck would have it, the fire guardian lives directly south - and the Founder will give you an item to stop the lava blocking your path, along with a Golden Battle Spoon and an Agility Orb. 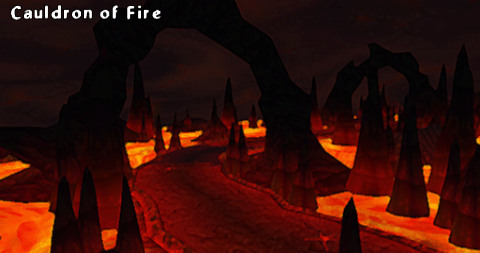 Follow the 'black road', using the pedestal to clear the lava, and enter the next dungeon. If you feel like it, return to Miamecca using a save statue. A new quest has opened up, and there is a new Battledome challenger. Talk to Zim outside the Palace to begin the quest. He'll send you to talk with Izzie. You'll find her on the west side of the map by the docks (but still on the main Miamecca map). She'll send you to Gerdy, so head to the Docks. Gerdy is the Miamouse near Smythe's shop. She'll then send you to speak to Sheldon on Market Street who is in the south of the area. With that sorted out, return to Zim for a reward of a Sun Token. Now you see why it is better to do this as soon as you can, as if you keep training the token will eventually become useless. With that done, use the large save statue in the middle of town to return to the Western Desert. 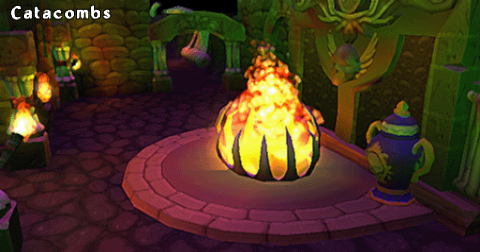 The fire lizards are elemental versions of Scamanders. 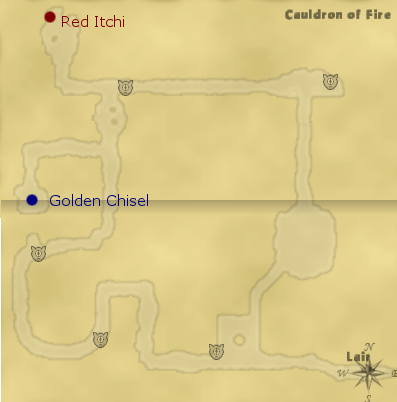 If you have water elemental weapons or fire shielding armour this section will be a lot easier, but no worries if not. You shouldn't have many problems if you keep moving and shooting. Following the path you'll eventually come across Fire Splykes like those you encountered in the Catacombs. Following the path from here will bring you to the other side of the fallen bridge, and you can carry on your way. In the next area, you'll come across the Fire Guardian. He'll ask to you recover his helmet from the Cyodrake, who is deeper inside the volcano. Beware the red cracks in the floor of this area. Bomb enemies can emerge from these. They fire long range blasts of powerful fire, but be cautious about attacking them up close. When they die, they explode, damaging you if you are standing nearby. The star shaped cracks also work as flame-spewing traps when you walk over them. After going through the lava and Splyke filled cavern, you'll come to a fork. Heading west will lead you to an area where you'll find the Golden Chisel that Kreshmaul wanted. Taking it will spawn a number of Baby Fireball enemies in the immediate area, so be prepared. Returning to the fork, head north and then west again to reach a new Petpetpet. More traps on the east path, they will spew fire out of the walls as you pass. Make sure to save before crossing the bridge ahead, as it will lead to your next boss fight. The Cyodrake uses a lot of fire based attacks, both long and short range. Personally, the best tactic for me is to run a long way away (so he is off the screen), and then fire backwards in the direction I've come from. Because the Cyodrake is such a big target, you are more likely to hit him than a normal enemy. Beware that a lot of his attacks carry an additional burning element that will drain your health over time, so keep healing and keep moving. Alternatively, stick close to him and his fire attacks will go directly over your head. You'll just have to watch out for his strong physical attacks. WARNING! 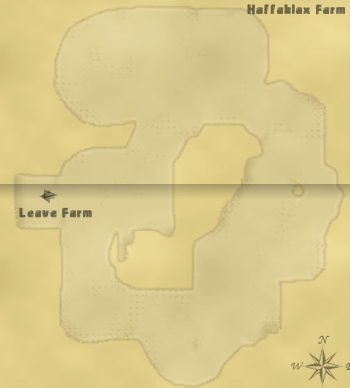 Once you leave this area, you will not be able to return to the Molten Caverns, the Fire Guardian's Lair, or the Cauldron of Fire ever again. Finish up any business you have before you exit. You'll also be temporarily frozen out of the Western Desert, but you get to return later. There's a shortcut back to the start of this area to the south of where you fought the Cyodrake, just shoot at it to reveal the path. Return to the Fire Guardian to deliver his Burning Gem hat. You'll get a Flaming Tech Bow and an Intelligence Orb as a reward, as well as a Fire Root that you'll need to find the next guardian. He suggests you find an apothecary to find the Earth Guardian's lair, and you'll find one in Miamecca. 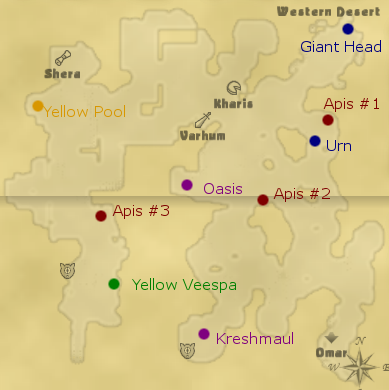 Instead of using the nearby save statue to return to the city, however, walk back to the Western Desert to find Kreshmaul. In return for the Golden Chisel, he'll give you 5 Small Health Potions and 5 Small Mana Potions. With that done, head back to Miamecca using a save statue or by talking to Omar. 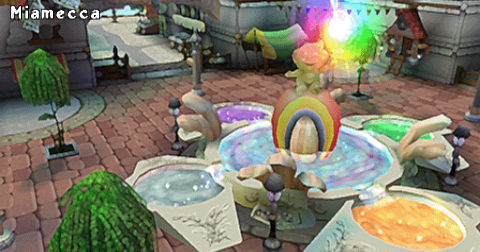 Heading back to Miamecca, you'll find Petunia on market street has a new quest for you - a special dye. Bogomil nearby also has a quest. You can accept it, but you won't actually be completing it by bringing back his seed. More on that later. Shops have also restocked with more powerful equipment. For now, head over to Ambrose just off the main street and talk to him. He'll give you a potion that can get you to Denapas. 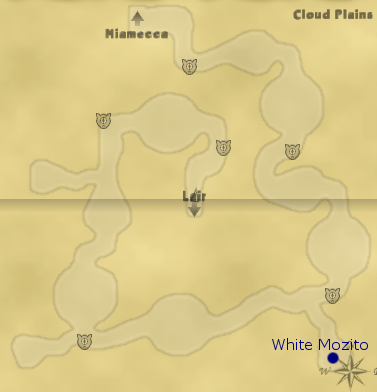 Using the potion nearby will take you back to Miamecca for now. 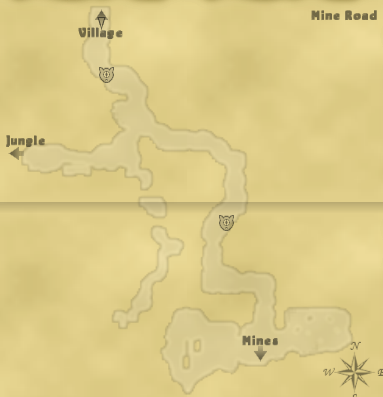 You'll come across stronger Crokabeks in this area, along with swamp lizards (stronger versions of fire lizards), and Cobralls (stronger versions of Wadjets). There are also traps in the area. Certain plants will spew gas across your path. 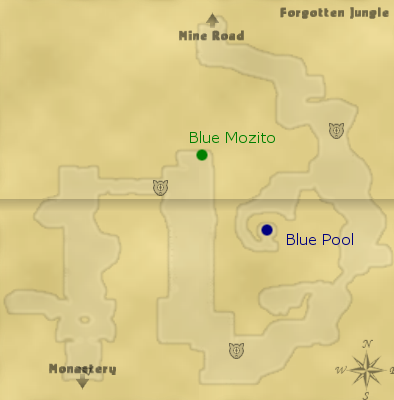 There are green pools that erupt with poison when you are nearby (these are not colour pools, even if they look like them. 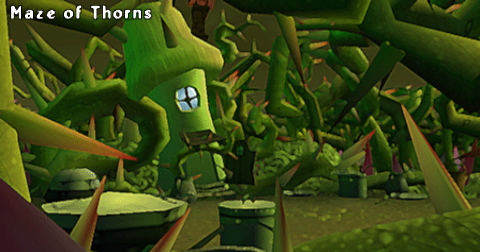 There's also a spiky plant that will explode with poison when you approach (but can only be triggered once). When you reach the fork, you can go either way, as the path joins back up in the swamp. The eastern path will lead to closer to a new Petpetpet, however. After the swamp, take the fork to the east again to reach Rorland - he want's a Cobrall poison gland for his special dye. Get one off a dead Cobrall for the special dye Petunia wanted. There is a red colour pool behind Rorland. Leonis is also hidden towards the end of the maze. Talk to him, and he'll offer to pay more for the rose seed than Bogomil will - it's him we'll be bringing it back to. If you're stuck for a way forwards, backtrack from Leonis to a small house. The door is open, and you'll find you can go through it to continue through the maze. Up ahead, you'll come across the Gnar, our next boss. Provided you've been training, he shouldn't be that difficult in his current form. As always, keep moving and shooting. When you reduce him to around half his health, he'll run off, opening up the passage to the next area. Silly to think it would be that easy, right? :( Before you leave, examine the One True Rose for the seed Leonis wants. You'll need the Spring Oil to claim it, which you can find in the maze by killing enemies/opening treasures. If you've done well, you should already have it in your inventory. 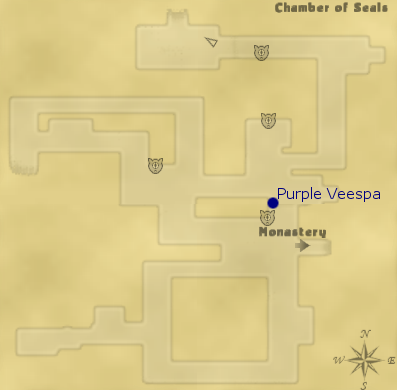 Return the Rose Seed to Leonis for 2000 Neopoints. 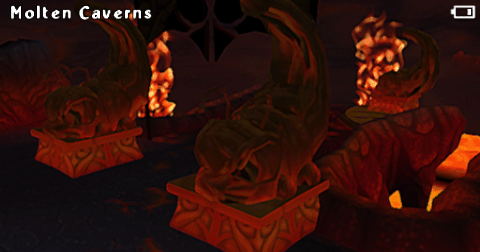 Return to the end of the maze and examine the statue to use the Fire Guardian's gift and open the path. In the next area, the Gnar is back, and this time he has a new trick. He can jump on the ground, producing a shockwave and activating several spike traps hidden in the area. He can also breath smoke which will poison you on contact. All this serves to make him a little bit more dangerous, but still, if you beat him once, you can do it again. WARNING! When you leave the Maze of Thorns to return to Miamecca, you cannot return. Finish up the two quests now, or you'll be locked out of them forever. With the Gnar defeated, the Earth Guardian will give you an Earth Orb and the Jade Skin spell. She'll also give you a Wind Bag you can use to access the Air Guardian's lair, instructing you that someone in Miamecca can get you there. Return to the maze and use a save statue to return to the city when you are ready. Back in Miamecca, head to Market Street to give Petunia her dye. She'll give you 2000 Neopoints in return. 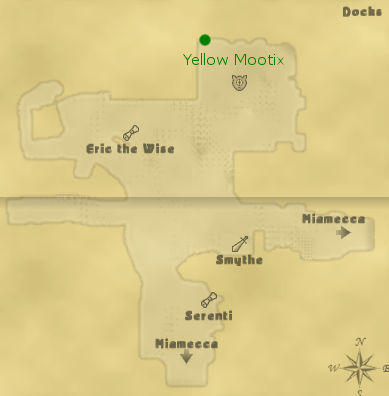 Now head back to the east of the main map to speak with Ethne. Her invention is finished - and you can try it out. You'll gain passage to the Cloud Plains. Before you leave, remember that once again the shops have restocked with new equipment. This area can get a little confusing. First, interact with the Founder statue to clear your way. First, you'll come across a lightning version of the scarabs from the desert. Approach them in the same way and you'll be fine. Keep in mind that they can hide inside the bigger breakable clouds though - if one shakes, get ready for battle. Up ahead you'll find Pudgee. He needs 5 Heavy Pebbles that you can find scattered throughout this area. You'll probably end up with too many, so once you have given him 5 and got the 5 Cloud Burgers as a reward, you can discard the remaining pebbles (as you cannot sell them). 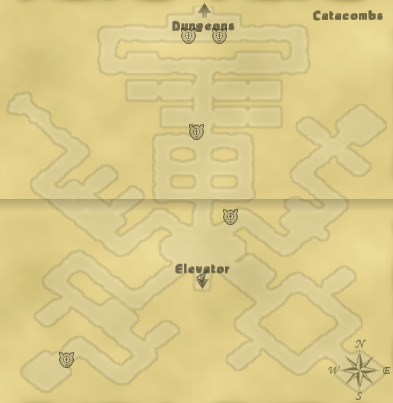 In the next area, you'll find your first Dragoyle. This one is a magician type, with powerful long range magic. Killing it frees the Breather in the area - you need to free the remaining ones in the level as you progress. The Dragoyle should also drop a key which you can use to unlock the gate and progress. In the next Breather's chamber, you'll find bomber Dragoyles. They act like the bandit bombers you encountered earlier in the game. Again, one of the enemies will drop a key to progress. Up ahead, the passage branches off. You'll find little Barbat enemies down the southern fork along with a new Petpetpet, but it is the western fork you want to progress. After that, this area is just more of the same. Free the breathers, and explore side passages for Barbats and treasure. At the end of the level, go through the door to access the Air Guardian's Lair and the next boss battle. The Dragoyle King begins the battle with some scarab friends. Deal with them first, as they get very annoying with their long range attacks. The King himself is like a stronger version of the magicians from the previous area. His main annoying ability is the shield spell he uses to make himself immune to weapons. When it flashes red, it is about to disappear. In the meantime, use magic, as that can get through the shield. His actual attacks are powerful and lightning based, so be prepared to heal. Defeating him frees the Air Guardian, who rewards you with another Small Pouch and a Health Orb. 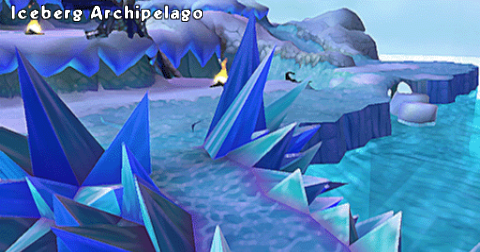 You'll also get a Crystal Tear you can use to access the Water Guardian's home on the Iceberg Archipelago. WARNING! Upon leaving the Cloud Plains, you cannot return. Finish up all business before leaving. Back in Miamecca, check the restocked shops and then head for the docks. There, Captain Dobbs has arrived. He'll take you to the Iceberg Archipelago. We start in Iceberg Landing, a small area. Use the Founder statue to open the path to the far larger Archipelago. In this section, you'll come across Blurtles. The ones with the blue/purple shell attack up close, whereas the ones with the green shells prefer to blast you with fire from a distance. Head to the north at the fork, and then north again. Here you'll come across a ruined ship. Onboard is a logbook. Captain Dobbs wants this, but we can deliver it to him when we are finished with our Water Guardian related business. Heading down the other fork, you'll reach a path heading up the mountain. The Triffin will make an appearance, summoning up Snowickles. These are water elemental Scamanders, and can hide inside the breakable snow piles. Carrying on, you'll come across Urnst. He wants you to recover a Crystal Burger from the Archipelago. You can find it in a nearby treasure chest. Returning it to Urnst gets you 500 Neopoints. As you climb the iceberg again, the Triffin will launch giant snowballs at you. No way to damage them, so run quickly up this section to avoid them. Once you reach the area where the Triffin was standing, the snowballs will stop spawning. Just ahead of this, you'll find ice lizard enemies, more powerful than standard Snowickles, who can freeze you to the spot with their breath attacks. WARNING! 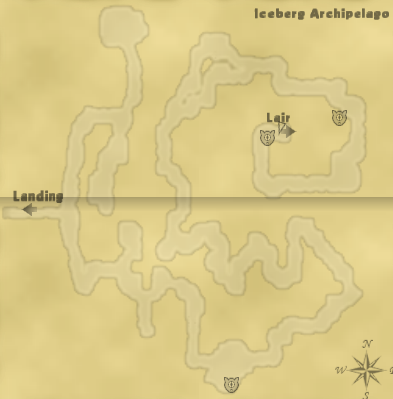 When you leave the Iceberg Archipelago for the next area, you cannot return. Also, when you leave Iceberg Landing you cannot return. Finish all business before leaving. Heading inside the cave at the top of the iceberg, you'll come across the Triffin, and it is time to fight. As you might expect, it is mostly physical attacks at short range that the Triffin has to offer. However, he can launch a roar attack that will cause icicles to fall from the ceiling, and can also generate a giant snowball to throw at you. At this point in the game though, he really shouldn't give you any difficulty. With him bested, talk to the Water Guardian. You'll get an Ice Mace and a Light Orb, as well as a Prismatic Diamond to open the Light Guardian's Lair on Shadow Island. Leaving this area will return you to Iceberg Landing rather than the Archipelago, hence the warning above. 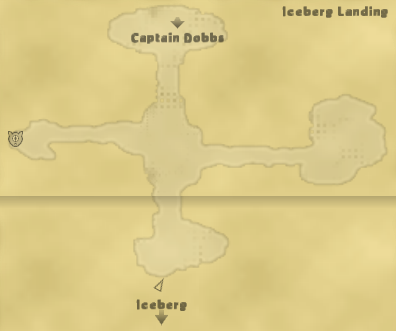 Captain Dobbs will take you straight to Shadow Island if you like, but alternatively you can return to Miamecca. Either way, you'll get 1000 Neopoints for finding the Captain's Log. In Miamecca, Sonya is finally ready to speak with you in the Docks, provided you spoke with her earlier in the game, and will give you some easy money for answering her questions (don't worry if you haven't been paying attention to the plot, there is no way to fail her quiz). Urnst has also returned to the city and opened up a shop on Market Street. After your visit to the Iceberg Archipelago, you should now have all the required foods for Joby's quest on Market Street. Your reward for all the hard work is an Iron Crown and a Founder Cookie. As always, visit shops to stock up on new armour and weapons. You'll find Captain Dobbs in the docks again when you want to continue with the story. The idea here is very simple. There are seven pylons in a ring around the outskirts of the island. Lighting them lights a corresponding pylon in the middle of the island (one of each colour of the rainbow). In order to light a pylon, you must kill all enemies near it. You'll find upgraded versions of both Dragoyle wizards (Zumagorns) and red Crabulas (upgraded scarabs, which can also hide within the breakable crystals) guarding the pylons, along with blue Crabulas - a new enemy type. Though they look like scarabs, do not be fooled into challenging them up close, as they have very strong short range attacks. If you're having difficulty breaking the bottles in this area, it is because you are using a long range weapon - arrows go over the bottles instead of breaking them. You can use magic to break them, or a short range weapon. There are also traps in this area, pools of dark energy that damage you when you stand near them. Again, though they look like colour pools, they are not. 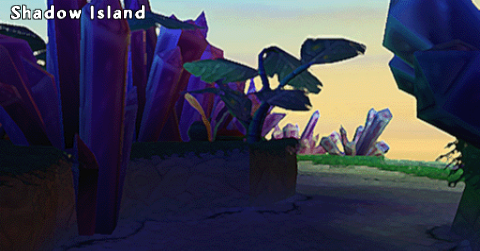 There is a Petpetpet hiding in a giant sand castle near a pylon in the south of the island. Once all pylons are lit, head for the center of the island. 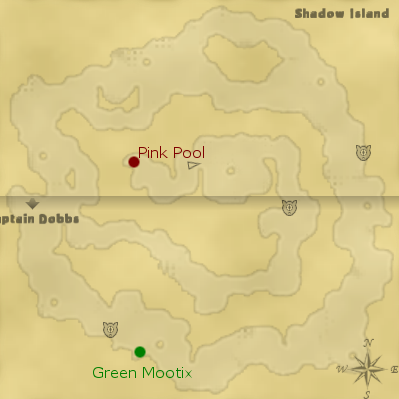 You'll find a pink rainbow pool in the deepest corner. WARNING! As soon as you interact with the Founder statue, you will trigger a cutscene which sends you to the next area. At that point you'll be locked out of Shadow Island forever. Finish up all business before continuing. The Mad Whoot you are now faced with attacks using light and dark magic, like a different elemental version of the Dragoyle King. He'll likely begin the fight with a shield on, so it's magic time until that wears off. A lot of his attacks drain your health gradually over time, so be careful of that. He can also teleport to escape you, and turn himself invisible, just for good measure. Still, just keep shooting and he should be down before too long. Talk to the Light Guardian after the Mad Whoot is defeated for a Shining Sword and a Defence Orb. The evil force who had depowered the Guardians now shows herself - that mean Dark Guardian! She'll run off to meet the Werhond, and the Light Guardian offers to teleport you to the western desert. You'll find Omar right in front of you. He'll tell you that the Werhond has captured the Founder. With the Molten Caverns closed up, you don't exactly have many options left other than to go through the entrance to the now ruined temple that's right behind Omar. There are a few shops here selling stuff, but at this point in the game the treasures you've found in dungeons likely outstrip those on sale. You can return to Miamecca using a save statue if you like. No new equipment in shops this time, but there is a new Battledome challenger. Once you are done with your training needs, head back to the big save statue and return to the desert. WARNING! 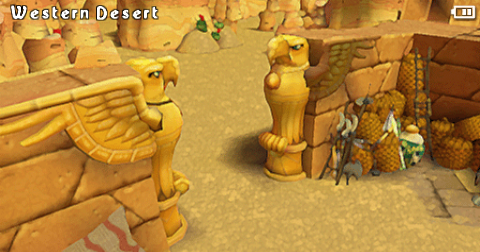 Upon entering the temple, you'll be locked out of the Western Desert forever. Finish up any business you have now. Inside, the Dark Guardian is cast aside by the Werhond. He'll summon the previous bosses of the game, and it is your job to beat them each in order, starting with the Bandit Lieutenant. The Dark Guardian will heal you between fights - just talk to her. Next is the Cyodrake, then the Gnar, Dragoyle King, Triffin, and finally Mad Whoot. With this done, the Werhond loses his shield and you are launched into the final fight of the game. The Werhond isn't an easy fight. He can summon one of those annoying protective fields that make him immune to any non-magical damage - this shield is dark based. He has a standard swipe attack, and an area of effect slam attack. He can also make rubble rain from the ceiling to harm you. If that wasn't enough, he can summon elemental drones, for want of a better word, that can move independently and cast elemental spells. Best to deal with them as soon as they appear, as the spells include freezing ones. With the Werhond defeated, the world is saved! Fluffy returns to Megan, and she makes everything right with the world again. After the credits roll, you are offered the chance to save and return to Miamecca. Hurray, you may think, lots of post game content! Well, think again. You are returned to Miamecca, but all areas beside the main street, docks, and market street are still locked out. So no adventuring - you've got all the Neopoints and items you're getting. And the only fighting is in the Battledome. Speaking of which, the Werhond has opened as a challenger, allowing you to train stats to maximum. But given that the only fighting is in the Battledome, there doesn't seem much point. Additionally, there is a shiny new set of armour in Ethne's shop. Hurray! You likely won't have enough Neopoints to manage both, though, so choose carefully. ...yes, that really is it.